The 1868 Leonard Street Police Station -- Nos. 19-21 Leonard St.
By 1862 Nathaniel Bush had achieved the rank of sergeant within the New York Police Department. That year his responsibilities were expanded when he was made the official architect for the force. Bush’s station house designs were attractive but no-nonsense. Repeatedly working in the popular Italianate style, he followed a tried and true plan—a symmetrical façade featuring a centered entrance, Renaissance pediments over some openings—both triangular and arched—and molded lintels. In 1867 he began work on another. The Fifth Precinct had been located at No. 49 Leonard Street for years and its station house was outdated and inadequate. Two old buildings at Nos. 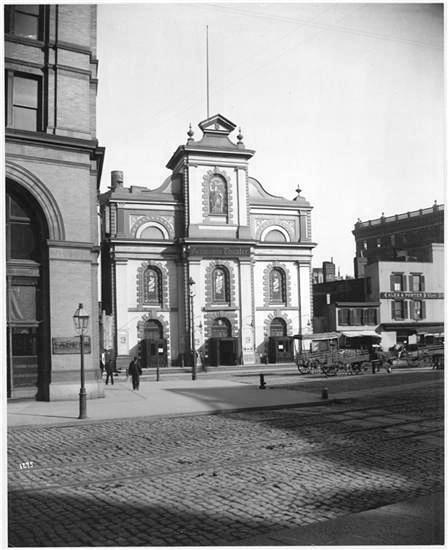 17 and 19 Leonard Street were demolished and construction begun on a new station house and jail, over 50-feet wide, for the Fifth Precinct. The 97 officers assigned to the new building fought a different type of crime than those in the notorious Gaslight or Tenderloin areas. 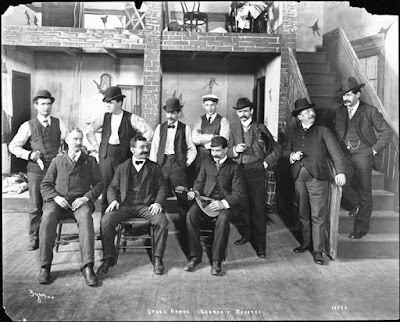 In the “dry goods district” downtown there was little problem with prostitution, illegal saloons or gambling; but there were plenty of con artists and robbers. 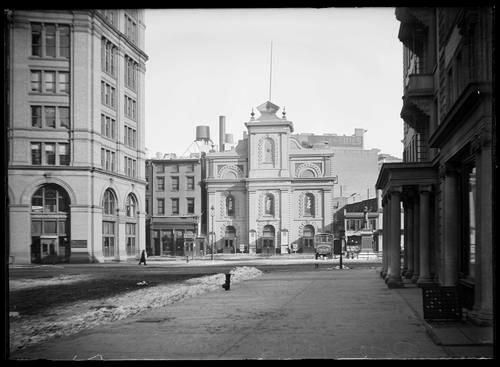 On November 15, 1868 The New York Herald reported “The confidence operators of New York being stimulated by the unparalleled boldness of bank burglars and check forgers in their games of late, are and have been maneuvering recently with a vim and action that remind the police authorities of days long passed.” The newspaper pointed to scam committed in the Fifth Precinct. The day before a Canadian, William McDonald, walked into the station house. He had arrived in New York that morning. For two decades thousands had headed to California to strike it rich and now the Transcontinental Railway was nearing completion, making the trip decidedly more convenient. McDonald, described by the newspaper as “a man of modest demeanor and unsophisticated ideas,” intended to join the migration. At the ticket office on Canal Street the clerk refused to accept his Canadian gold coins. He was instructed to go “up the street” and exchange his money for American currency. On the way he was stopped by a “well dressed man who asked him if he was going to San Francisco.” One thing led to another and before too long the con man had convinced McDonald to allow him to exchange the gold for American $20 coins. In addition to handling crimes like fights among the sailors who arrived on ships docked at the nearby Hudson River piers; the officers of the Fifth Precinct also dealt with more humanitarian issues. Insufferable summer heat coupled with layers of Victorian clothing was a deadly combination. On August 14, 1872 alone three victims of heat and sun stroke were carried into the station house. One of them died there. 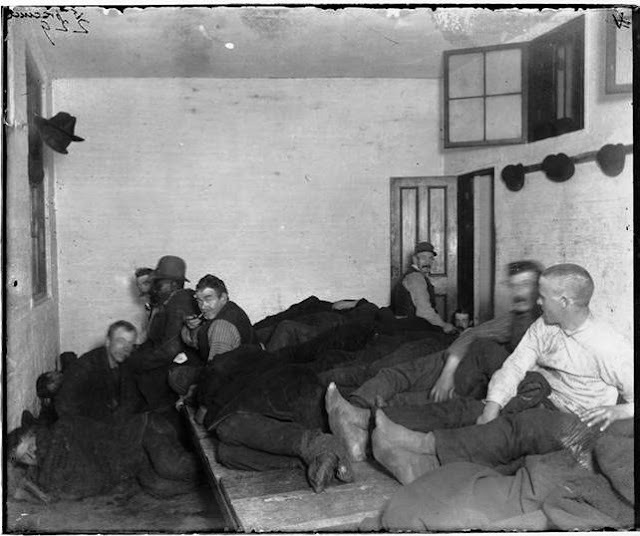 The living conditions of the poor, too, were sometimes the concern of the Fifth Precinct. On June 12, 1871, for instance, The New York Times reported “A horror tottered into the Leonard-street Police station yesterday morning, in the person of Eliza Gamble, who had come from No. 29 Hubert-street, carrying her week-old infant in her arms. Both were plainly dying for want of proper nourishment, and appealed without a word for succor.” The starving woman and her baby were taken to Bellevue Hospital. The Fifth Precinct had, of course, its share of more serious crime. On September 9, 1881 Thomas Quinlan walked into the police station and informed Sgt. Doran that his wife, Julia, had died during the night. 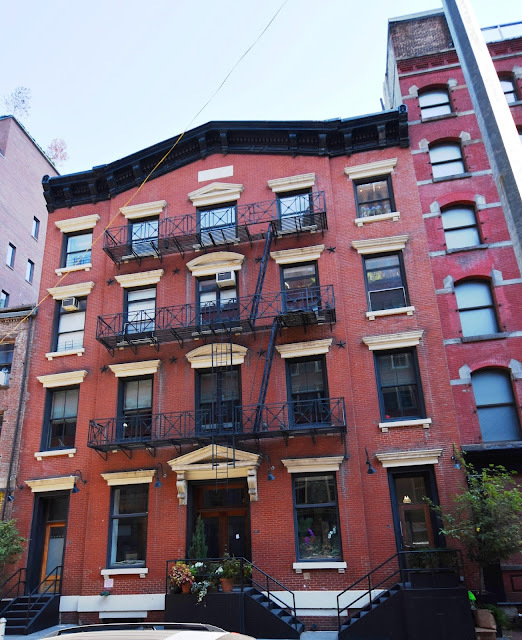 Quinlan, who was a longshoreman, lived with his wife in a tenement building at No. 78 Watts Street a few blocks north. Quinlan explained that his wife was “an industrious and good woman, but was of extremely intemperate habits. For nearly a month past, although sober during the day, she was drunk every night.” He told the sergeant he was willing to sign an affidavit that “she had not gone to bed sober one night in three weeks.” He said that when she was drunk she would often threaten to take her own life. That night, when he got up around 4:00 in the morning, he said, she was lying on the floor. He assumed she had left the bed because of the heat, so he did not disturb her. When he arose at 6:00 to go to work, she had not moved. When he tried to arouse her he found her dead. According to The Times “The case was regarded by the Police as one of ordinary nature, and it was not until a rumor reached the station-house that the woman had not died a natural death that any action was taken.” Only then was an officer dispatched to the apartment. Quite astonishingly, although the Deputy Coroner thought “it impossible for her to have tied the strip of calico about her neck herself,” and was led to “suspect that she may have met her death at the hands of her husband,” The New York Times reported “All the indications were that Mrs. Quinlan had committed suicide. Nathaniel Bush’s station house buildings were functional, but they were most often poorly ventilated and lit. In 1881 the Fifth Precinct Station House was deemed “unsafe” by the Bureau of Inspection of Buildings. The City budgeted $5,000 to bring it up to standards on March 20, 1882. At around 11:00 on the night of July 12, 1883 Capt. Eakins was sitting on the station house steps, no doubt to escape the heat inside, when a young man walked up and bowed. He was about to give Eakins a startling confession. Police had been looking for Aleck Boyer for about three days. During the weekend of July 7 he and another man got into a vicious argument which would later end in death. The New York Times explained later “Robert Simpson, a truck driver, was living with a mulatto woman. He and Boyer, a boatman, got into a quarrel over the woman’s slapping a boy for striking her with a stick. Both were drunk.” The disagreement ended with Simpson knocking Boyer over the head with a cast iron stove lid, and with the woman threatening revenge. Robert Simpson was married, although he had been living with the woman involved in the conflict. On Monday night, July 9, he went to the saloon at No. 2 York Street to meet his wife “and make up with her.” Aleck Boyer had trailed him and while Simpson and his wife were talking in front of the saloon, Boyer rushed up and stabbed him in the head. “Simpson ran into the saloon, came out again, fired off a pistol, and fell dead on the walk,” wrote The Times. Now, on Thursday night, Aleck Boyer introduced himself to Capt. Eakins. It was an easy conclusion to manhunt. There were occasional murders and serious incidents in the Fifth Precinct. It was the here that the notorious con artist “Tom” Davis was murdered by James T. Holland, a Texan who had paid him $500 in exchange for $10,000 in counterfeit bills. When Holland discovered the bundles were composed of bills on the top and bottom, and blank paper inside, he reacted by returning and firing a bullet into Davis. The trial was a national sensation. But as the 19th century drew to a close, highly-publicized crime in the Fifth Precinct came from within the Leonard Street station house, rather than from the streets. Graft and corruption were brought to light in 1891 when neighboring businessmen finally revolted against the extortion practices of Captain Thomas Stephenson, whom The Evening World described as tall and handsome. On August 30, 1894 the newspaper reported “After many days of waiting, Police Captain John Thomas Stephenson was to-day placed on trial before the Commissioners at Police Headquarters of several charges of bribery.” Testimonies throughout the day revealed the scheme by which the Fifth Precinct police, most notably the Captain, received money and goods. With its honor restored, newspaper accounts regarding the Fifth Precinct again turned more positive. None more so, perhaps, than that of Policeman Norman Sheldon and a “big, shaggy, tramp Newfoundland dog” on August 1895. Officer Sheldon was about a block away when he saw the massive canine running wildly down Chambers Street, followed by a mob of men and boys. The Times reported that it was “given a wide berth by pedestrians, who ran into stores, cellar-ways, and hallways to get out of his path.” As the beast and his pursuers neared, Sheldon ran into a store and got a rope, which he quickly tied into a slipnoose. Blair, in the meantime, sent for some meat for the dog. By the time he was taken away he was as “quiet as a kitten.” The sergeant initially wanted to keep the dog as a station house mascot; but “owing to his advanced age,” decided against it. The number of killed or injured topped 400. Members of the Bureau of Information pulled together the information and witness accounts here regarding the disaster. Eight years later the officers of the Eighth Precinct would deal with a different type of explosion. On March 28, 1908 a Socialist protest which drew about 7,000 participants to Union Square threatened to get out of hand. The Eighth Precinct was called to help control the unruly mob. By the time World War I had broken out the old Leonard Street station house was decidedly obsolete. On March 24, 1917 the Real Estate Record & Builders’ Guide reported that the City was “nearing conclusion” of negotiations involving the liquidation of several properties, including Nos. 19-21 Leonard Street. In June 1918 the building was sold for $45,000 (a little over $700,000 in 2016) to Texan Robert E. Paine, owner of Standard Rice Company, Inc. Two months later The American Contractor announced architect Charles Schaefer, Jr. had been commissioned to convert the building for “storage and loft” purposes. The renovations, which cost $2,000, included the installation of a loading platform. Standard Rice Company would occupy the building several decades. In 1941 it was home to the Semer Hardware Company. Other tenants included the Ronald Paper Co., the Hailer Elevator Co., and the Empire Elevator Corporation. 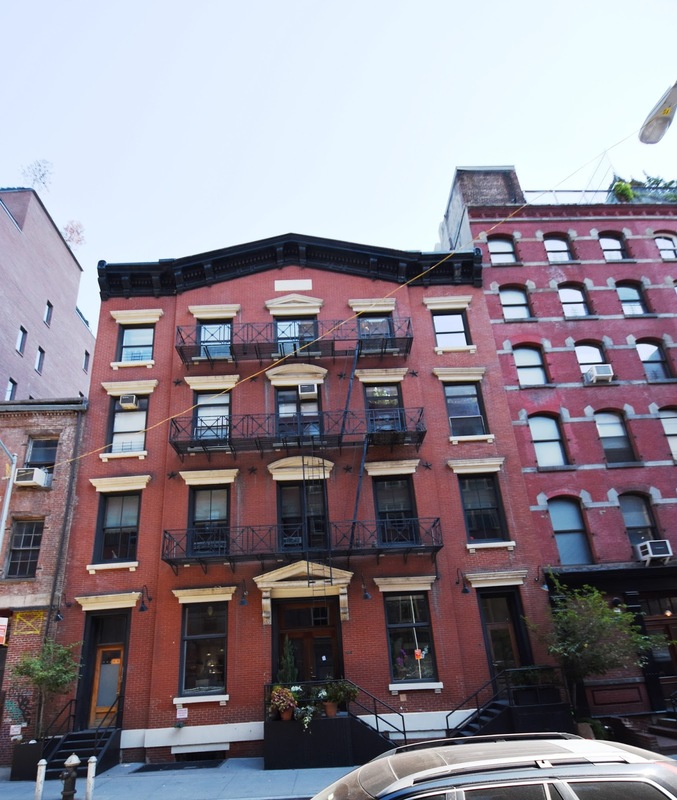 Then in 1999 as the Tribeca neighborhood was rediscovered, it was converted to five apartments. Robert E. Dowling was 48 years old in 1902. He had opened his real estate office at Columbus Avenue and 104th Street in October 1885. By now he was a real estate mogul, having co-founded the New York Realty Company and built the Sherman Square Hotel along with dozens of other Manhattan buildings. In addition he was a director or officer in several corporations. 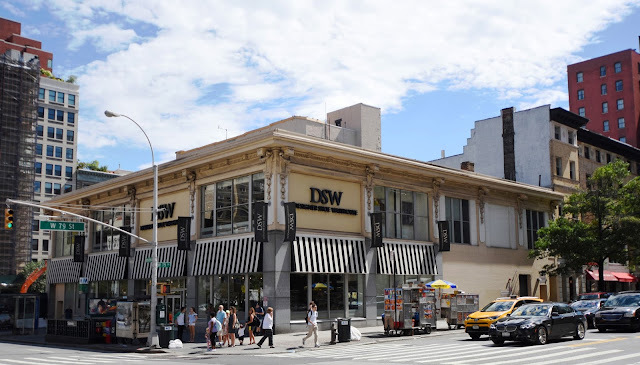 In April 1902 Dowling purchased the large property at the northeast corner of Broadway and 79th Street from the Blodgett Estate. The developer paid a significant $175,000 for the plot—just under $5 million in 2016 dollars. Spreter had chosen the location wisely. The new Broadway subway station had just opened directly across the street, providing easy access to shoppers. His lease, which ran from September 6, 1906 to April 30, 1915, totaled $10,000 for the ground floor and basement. Dowling would include a second story for additional rental income. By the time of the Tribune’s article construction was well underway. Foundations were begun in October and the department store, designed by John H. Duncan, was taking shape. Were it not for the fact that Dowling routinely used the services of Duncan, the choice of architects might have been surprising. John H. Duncan was best known for designing mansions (in 1905 he would design Dowling’s own mansion on Riverside Drive); and for monumental works like Grant’s Tomb and the Soldiers’ and Sailor’s Memorial Arch in Brooklyn. Spreter’s Department Store was completed by the fall of 1906. Duncan’s design was as much plate glass as it was masonry. Vast show windows on both floors allowed for abundant display as well as the admission of natural light. 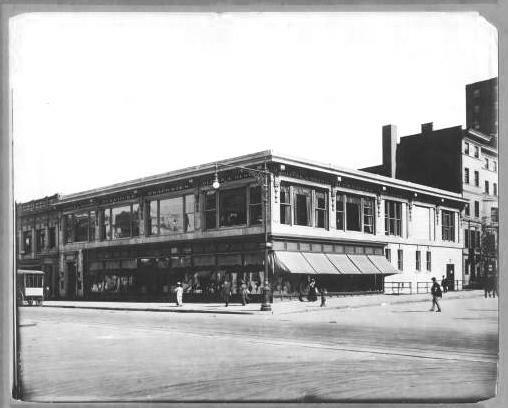 A cast iron and glass storefront wrapped the corner, extending down 79th Street and along Broadway almost to the northern end of the building. The upper floor and the northern entrance were clad in creamy terra cotta. 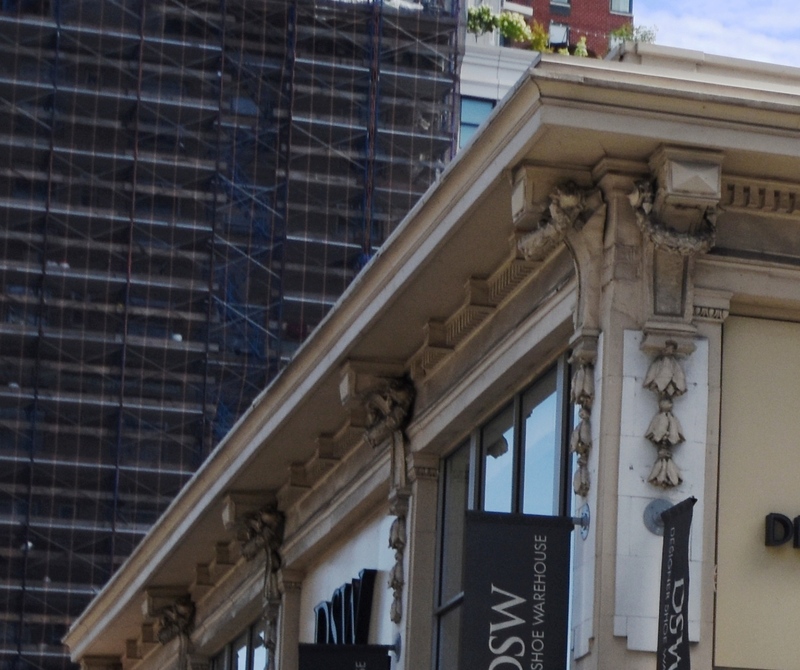 The deeply overhanging cornice was supported by scrolled and wreathed brackets. Terra cotta bell flowers dripped down from each bracket onto the blank panels below. In December 1906 Dowling leased the entire second floor to Madame Yale “for the manufacture of toilet preparations.” He sold the year-old building in November 1907 to Archibald D. Russell. Unlike Dowling, the new owner would maintain ownership for decades. Despite its 10-year lease, the Spreter Department Store was gone by 1913 when the Oliver A. Olson Co. department store took both floors. Olson Company called itself “The Store of Service” and offered everything from apparel to furniture and draperies. When Oliver Olson decided to expand the corset department and move it to the second floor in September 1917, the department’s manager, Miss Henry, searched out a new type of fixture “that would overcome the difficulties of proper display in the corset department,” according to The Corset and Underwear Review. Miss Henry’s customers could expect to pay from $3.50 and up for the latest in Spring corsets that year. In May 1930 Louis Barnet resigned as executive vice-president of R. H. Macy & Co. and purchased “the business and good-will of Oliver A. Olson & Co., Inc.” Now president of Olson & Co., Barnet immediately announced that he had signed a 21-year lease on the corner of 74th Street and Broadway as the new site for the department store. 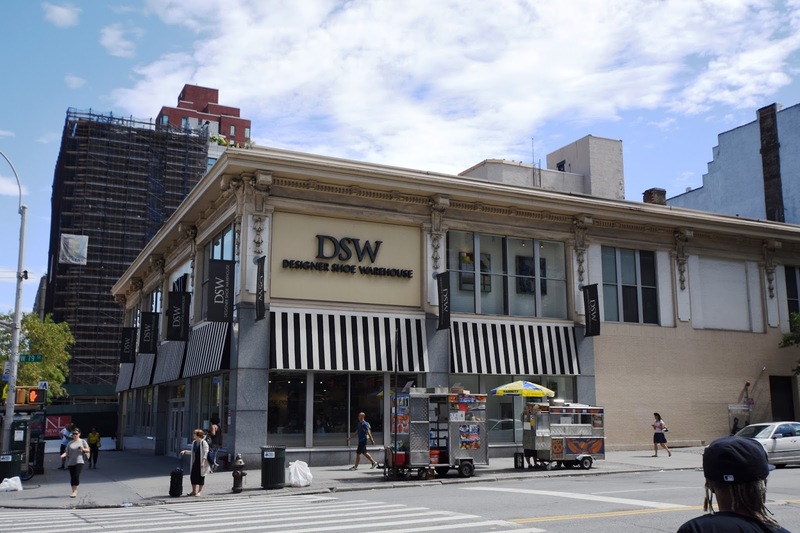 After being a 79th Street fixture for 13 years, the department store was replaced by an F. W. Woolworth store. On August 14, 1930 The Pittsburgh Press announced that the Woolworth Company had signed a 63-year lease on the two-story building “having a total rental of approximately $5,000,000.” After renovating the store the Woolworth branch opened around November 1 that year. Woolworth stayed on in the building that seemed nearly custom-made for the five-and-dime. It was not until 1945 that the estate of Archibald Russell sold the structure for about $1 million to Frederick Brown. He resold it five years later. Following the expiration of the Woolworth lease, No. 2220-26 Broadway became home to a Filene’s Basement store. It held a going out of business sale in 2011. Today the low-rise department store building is home to a shoe store. The cast iron and terra cotta ground floor has been annihilated in favor of insipid granite panels. The second story, thankfully, survives mostly intact; a reminder of a time when female shoppers browsed among the latest styles in corsets. Although the majority of Manhattan’s wealthy citizens were Episcopalian, St. Ann’s Roman Catholic Church filled with fashionable parishioners. In April 1865 the well-dressed worshipers would listen especially intently to the words of their pastor. 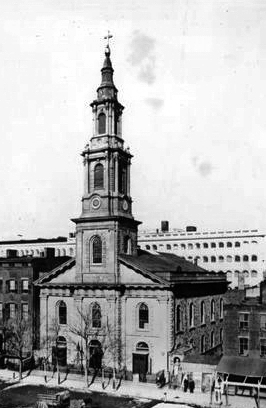 The new church was dedicated on New Year’s Day, 1871. The previous day the Catholic Church had petitioned the Supreme Court for “an order granting leave to sell St. Ann’s Church…together with the parsonage and school-house adjoining.” The petition pointed out that dry goods mogul Alexander Turney Stewart had agreed to buy the property—paying $75,000 in cash of the $125,000 selling price. Alterations were made to the building and Stewart used it for the manufacture of bedding. Nine years later the Stewart Estate leased the building to theater manager Jacob Aberle. The once exclusive residential neighborhood had changed much and was now part of the northward moving entertainment district. For New Year’s Eve that year Aberle staged a special attraction, a “modern drama” entitled The Poor of New York. The New York Herald wrote “It is based upon scene in New York during the financial crisis of 1837-38 and is a story of fraud and its victims, with the usual accompaniments of wealth, luxury, destitution and misery.” Jacob Aberle was no doubt especially excited about the staging of this new play, because it would be the debut of Miss Laura Aberle as an actress. The “story of fraud and its victims” was especially appropriate, considering that less than a week later Aberle received a restraining order which prevented his giving any further presentations of the play. “The proceeding is taken on behalf of Francis Mayo, who claims to be the owner of the piece,” explained the New-York Tribune on January 11, 1880. Reilly broke free and ran off with the officer “in hot pursuit.” The delinquent teen quickly discovered that assaulting a policeman in 19th century New York came with its costs. “When the fugitive was brought back he was bleeding profusely from a wound on the right side of his head,” reported The Times. The boy had to be taken to the station house on a stretcher. He complained that Golle had whacked him on the side of the head with his club, knocking him down. Aberle’s problems only increased when he staged The Boss; or, Waiting for Vengeance in February 1883. One of the actresses was an eight-year old girl who went by various names including Lillie Atkins, Petite and May Atkinson. In the audience on Tuesday night, February 6, was an officer of the Society for the Prevention of Cruelty to Children. The New-York Tribune reported “He observed that the child seemed delicate, that she was poorly clad and that she was suffering.” The girl appeared on stage three times during each performance, which did not conclude until around midnight. The following day Aberle was informed that she must be removed from the cast. An officer checked in on February 8 to make sure the order was being obeyed. To his surprise (or not) the little girl took her place on stage exactly as before. Not only was the girl’s father arrested, but so was Jacob Aberle. He was held at $500 bail—a significant $12,000 in today’s dollars. The Eighth Street Theatre suffered scandal when actress Lillie Ellis committed suicide “in the saloon” of the theatre two weeks later. According to testimony the following week, she was infatuated with a man named James Ryan. On Wednesday night, November 12, 1884 the two apparently had words. Ryan told Coroner Martin that he “was leaving the room when she shot herself.” Another actress, Minnie Western, testified that Lillie was intoxicated and the matter was closed. Like Jacob Aberle, John Thompson found himself on the wrong end of the law. He was arrested for serving liquor in the theater without a license; and also for “assaults and brawls at the place.” But things got serious in 1885. That year all of Paris was enthralled by the Can Can. Lines of synchronized dancers kicked their legs high, revealing stockings and petticoats; and at one point in they bent over and brushed their skirts above their pantaloons. Paris may have been ready for the Can Can, but New York society was not. Nineteen women and 45 men were arrested. Police searched the theater for Thompson, who was finally found trying to hide in a heap of coal in the cellar. He insisted he was in the engine room “bathing a sore eye with warm water.” He was held in $1,000 bail for running a disorderly house—the polite 19th century term for a brothel. John Thompson’s Eighth Street Theatre was closed down. Adolph Philipp, too, had some run ins with the law. He was arrested on January 24, 1899 when he decided to resolve a problem with Gustav Amberg, who had leased the theater from him briefly, by punching him in the nose. And a week later the theater was briefly closed when detectives felt that the “sacred concert” being staged on a Sunday night was in fact, an entertainment. 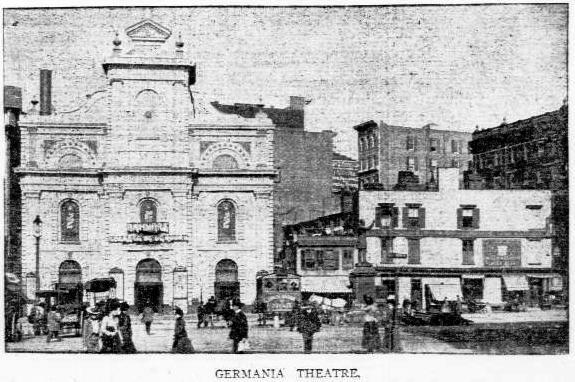 Shortly after the Germania moved out, the entire block where the old theater stood was demolished to make way for the new subway. The John Wanamaker Department Store's 1906 extension rose over the site of the old theater.